Most of you know that a few times a year you get a non-fishing related post here at MPF. This is one of those posts. 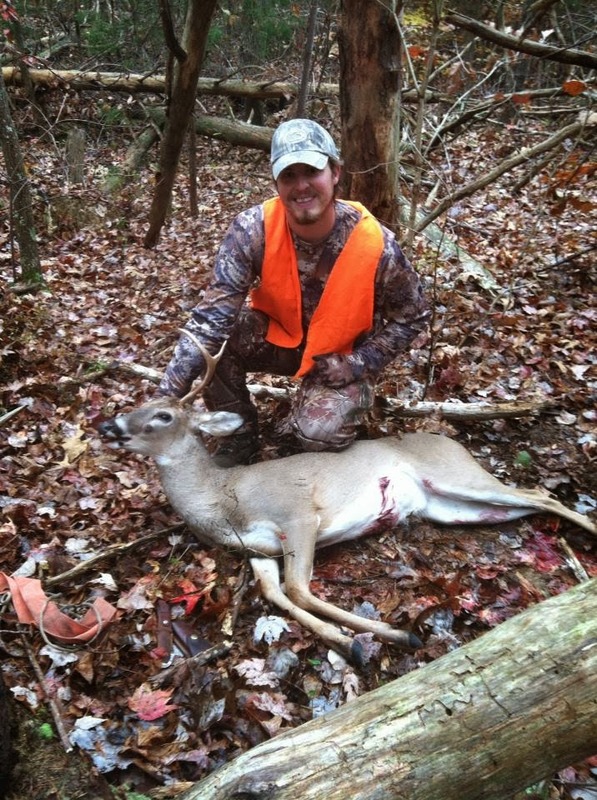 This past weekend marked the beginning of the deer hunting rifle season here in central NC. 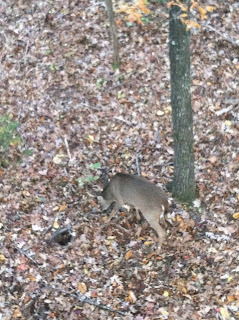 I had passed on quite a few small bodied deer in archery season in hopes that a bigger deer would eventually come my way. The problem was that I wasn't seeing big deer on our trail cam - literally only young 4 points and does. I had seen a couple nicer deer out the car window over the course of the past 3 or 4 months, but I knew we were on the outskirts of their home ranges. My hopes were that with the rut in full swing we would have a lot of activity in the woods. Thankfully, I was right and we filled the freezer. Nothing beats vension loin on the fire! Mary May and I were up around 5:30 AM Saturday and in the woods shortly after. Our land is only 10 acres and much if it isn't worth hunting. But one side has a funnel area with a slight ridge on one end and there are days when the deer use it fairly heavily. If you get really lucky, they may even pop up over the ridge and munch on acorns for a while on the massive oak flat behind the house. I decided to set-up at one end of the funnel and get Mary May set-up at the other end - about 1/4 mile from me. Then, we waited. Actually, the waiting was minimal. Mary May texted me that she had spooked some deer on her way into the woods. And not 30 minutes later, I heard a commotion behind me. It was a solid buck chasing a doe all over the woods at full speed. I had never seen anything quite like it as they zig-zagged through the hardwoods. Finally they came down toward the funnel, but they didn't stop long enough to give me any sort of shot. I texted Mary May to give her a heads up that they were headed her way. Meanwhile, I looked to my right and another buck - this one a 4 pointer - is meandering in behind them. I raised my rifle and put the deer in the scope, but decided to hold off. About the time he dissappeared a small doe came in and ate acorns just upwind of me. I was hoping a buck would come in behind her, but that didn't happen as she eventually wandered off too. I decided to hit the doe bleat call and almost immediately I heard something come in hard from behind me. It was a small spike buck. He took his time working his way to the funnel and I didn't bother even raising my rifle. As soon as he got out of range, I heard a - KABOOM! I knew it was Mary May and I started furiously texting her. About 5 minutes later I got the response, "clean miss". Bummer! Apparently what happened was that the bucks I saw chasing the doe had finally gotten to her and were moving too fast to shoot. But then, a 4 or 6 point buck came out from a flat to the east and was hot on their tail. But hey, we all miss - it is part of hunting. I was hoping the action would stay hot and she would get some redemption, in large part because I knew she would be beating herself up until she did. After her shot, the small spike buck circled back to me and ate acorns for about 10 minutes before moving on. Shortly after, I decided to try the bleat again. After a few minutes I spotted movement in the bottom to my left. 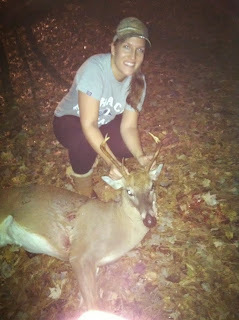 It was a young buck, but he had a solid rack and decent weight. I watched as he moved back and forth across the bottom - eating, scenting, and trying to figure out his next move. For more than 10 minutes he was well within range, but never gave me a clean look. 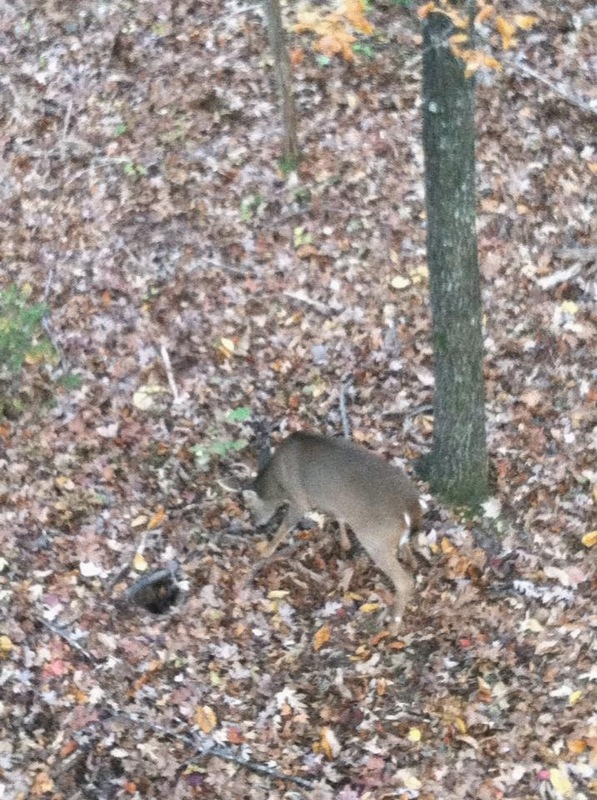 Finally, he made his way up my side of the draw and walked through a break in the trees. One shot through the lungs was all I needed. I heard him go down about 20 yards away, but gave him about 20 minutes before climbing down to find him. He was a gorgeous deer with a nice size body for here in central NC. I reported the harvest, gutted him, and drug him to the house before taking him to the processor. After I harvest an animal, I always get into a weird mood. Part of me is happy because a lot of planning, time, and effort mixed with a little luck made the hunt a success. But part of me is humbled, somber, and even torn. Hunting is a tradition for me passed on to me by my grandfather. Beyond that, we as mankind have hunted since the beginning of time and so I think it is a tradition that honors the heritage of us all. But, it is still difficult to reflect on taking a life. 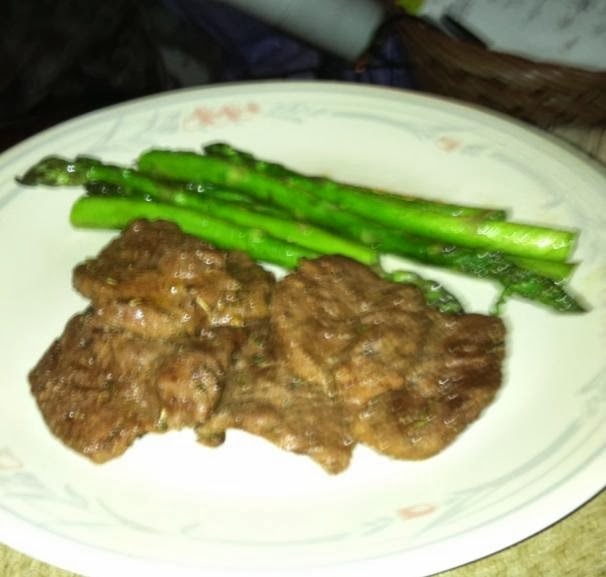 I know the deer will be used to its fullest and will put food on my plate - something that I believe connects me with the land. This is one of the reasons I tend toward being a meat hunter rather than an antler chaser. I don't understand the mentality of those who only want to shoot giant bucks. Is it nice to shoot a big buck - yeah, it sure is, but that shouldn't be the driving force behind why you hunt. OK, enough ranting...back to the story. I got the deer to the processor, ran some errands, and was back at the house by lunch time. I was torn between watching a full slate of college football while tipping back a few cold ones or returning to the woods. But eventually I convinced myself to get back outside and sit until dark. Mary May was also torn, but she finished her nursing school paper just in time and decided to head back out with me. Around 2:30 PM we resumed our spots at each end of the funnel and began waiting. This time the wait was long. For me, it never ended - I didn't see a deer all afternoon/evening. But around 5 PM I heard Mary May fire. A few moments later I got a text - "I think I hit him, but I didn't see or hear him go down". I told her to hang tight, get some visual landmarks of where she hit him and where she last saw him and that I would get to her as fast as I could - it would be dark in about 35 minutes. I grabbed a headlamp on my way past the house and hurried through the woods with the drag rope. We went to the spot where she shot at him - no blood. We went to the spot where she saw him last - no blood. We looked around the rest of the area for another 10 minutes - still no signs. So we reset and walked through it all again. This time I took a slightly different route and about 10 yards past where she had last seen him - I noticed a speck of blood on a log about half the size of a dime. I still have no idea how I spotted it in the dark. But then we found a little more blood and a little more and a little more. Then we saw him. We were ecstatic! It turns out that she had made a nice shot - through the lungs - but his adrenaline carried him further than we expected. She kneeled over him and said a silent prayer before we began the reporting, dragging, gutting, and cleaning process. The next night we celebrated with venison loin cooked over an open fire. It was a great ending to a great weekend in the woods with the woman I love. I hope everyone else found success on the water and in the woods this weekend as well. Until next time, tight lines!